Happy 2019! I hope your holiday break was enjoyable and you found time for rest and reflection. Here at the national headquarters, we appreciate the many blessings of last year but also look forward to a New Year full of possibilities. We are fortunate to work for an organization with such an important mission to develop America’s future workforce. Strategic Planning Week a Success! 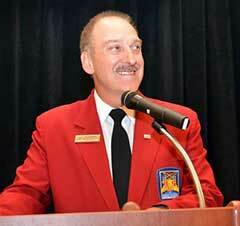 SkillsUSA staff spent last week in our annual “week of excitement” strategic planning meetings. We reviewed our four strategic imperatives and made sure we are all on track with all departmental objectives that rise to them for FY19, and then put operational excellence objectives on paper for FY20 and FY21. We also discussed the National Leadership and Skills Conference move from Louisville to Atlanta and new ways to make the conference closer to cost neutral. The State Directors Association officers will review highlights of the plan at their winter meeting this week in Atlanta, and we’ll finalize it for SkillsUSA Foundation review on March 13 and board review and approval on March 21. This was one of the most important weeks of the year for our staff to ensure we stay on a steady course with forward movement to deliver our mission. That’s it for now. As the new year gets into full swing, I want to thank you for making 2018 so amazing for the SkillsUSA students and teachers we serve. We look forward to working with you to change even more lives for the better in 2019! 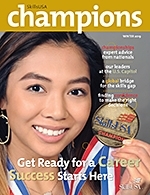 The digital edition of winter SkillsUSA Champions magazine is now available on the SkillsUSA website here: http://bit.ly/ChampionsWinter19. The digital edition includes everything in the print issue plus extra videos, direct links to external resources and other dynamic material. Call the SkillsUSA Membership Hotline if you need help in starting a new chapter, engaging chapter members, or discovering strategies to strengthen an existing chapter. If you have questions or need assistance with online membership registration, the hotline operators can take care of that, too. Call toll free: 844-875-4557 from 8 a.m.–5 p.m. EST Monday, Wednesday and Friday, and 11 a.m.–7 p.m. EST Tuesday and Thursday, or email operators@skillsusa.org. To learn more about the SkillsUSA Career Essentials curriculum and to gain a greater understanding of how to implement it within your program, we encourage you to sign up for a one-on-one, 15-minute demonstration of the curriculum. To sign up, click on the following link, complete the short information form and a coach will contact you to set up your demo: https://goo.gl/forms/jIS73zAkkDXSl80d2. For additional questions and assistance, please contact us at 844-875-4557 and ask to speak with a SkillsUSA Career Essentials coach. To visit the website, go to: www.careeressentials.org. You can participate in SkillsUSA Week many different ways: hold an open house, invite local media to tour your programs, conduct a community service project, work with area businesses to build more meaningful partnerships, or engage with policymakers to talk about the value of technical education. For a complete calendar of events, and resources including a sample proclamation, go to: www.skillsusa.org/events-training/skillsusa-week. Special thank you to Channellock as the lead sponsor of SkillsUSA Week and to Toyota for their additional support of this program. Each state association’s information will be collected through a survey that will be sent to each state SkillsUSA director. This will arrive by email the first week of January. The survey should only take about 20 minutes to complete. The deadline to return the completed survey is 14. Please plan to have your dues approved by your board before Feb. 14, so your complete information can be submitted on time. This survey will not ask for information regarding your conference dates. We understand that those dates and locations may not be confirmed by Feb. 14. State conference information will be collected later in the spring. If you would like extra membership kits sent to you for use at your training sessions, they will be available after June 1. Please be sure to include the date you will need them so we can get them to you in time. If you have questions regarding the State Dues and Deadlines Form, please contact Veronica Gomez at vgomez@skillsusa.org. As part of the SkillsUSA national headquarters’ NLSC safety and security plan, only the following registrants will be granted “ALL ACCESS” badges during the 2019 National Leadership and Skills Conference: state SkillsUSA directors and one assistant state director per state; SkillsUSA board of directors; national officers; and national staff. All other registrant types will have general attendee access. State association directors should refer to the NLSC Guide for detailed information on registrant types. If you would like to nominate someone for SkillsUSA’s national Honorary Life Membership or Outstanding Career and Technical Educator awards, please submit your nomination by Feb. 15. Awards are presented in June at the National Leadership and Skills Conference. Online applications are available at: www.skillsusa.org/membership-resources/awards. For more information, go to: www.acteonline.org.